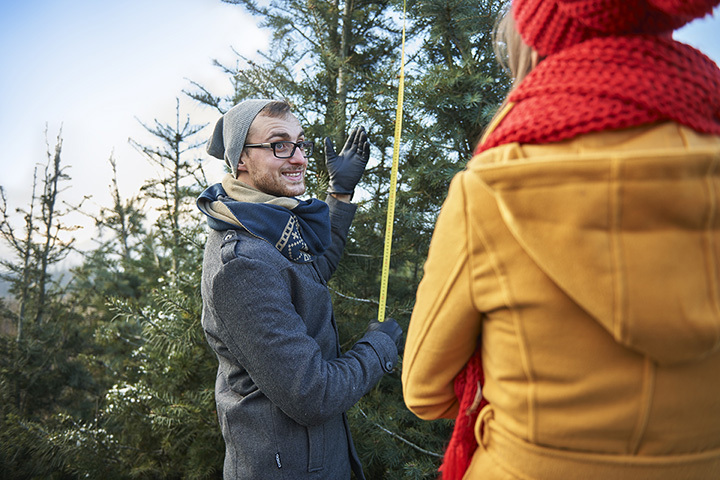 Bring the smell of Christmas into your home with a fresh-cut, farm-grown pine tree grown locally in Oklahoma. Not only will that tree provide weeks of enjoyment in your home, once the holidays are over, you can recycle the tree as mulch. Plus, you’ll be supporting a local family and supporting a tree farm that produces oxygen and absorbs carbon dioxide the rest of the year. Here are 10 Christmas tree farms in Oklahoma where you can make holiday memories. This farm is in the Tulsa area and has been providing holiday trees for more than 40 years. It has many different varieties of trees for you choose, as well as garland and roping for decorations. After you choose your tree, make sure to get some hot apple cider in the gift shop. Take a hay ride into the field to choose your tree. You can even chop it down yourself, or ask for help from an experienced woodsman. Santa visits regularly. The farm offers complementary hot cocoa, homemade cider and coffee once you’ve chose your tree. If you're wondering why I always post photos of them running, it's because they. don't. stand. still. In fact, I'm pretty sure they think "hey, let's take a picture" means "RUN". #photogkidsproblems Anyway, went to the Christmas Tree Farm (my very favorite family tradition) and went on a tractor ride, had popcorn/hot cocoa, and picked out the perfect tree. The holidays are so much more magical with small children. This farm north of Oklahoma City lets you choose and harvest your own tree, but offers pre-harvested if you’re not up to a trek into the field. After picking your beloved tree, enjoy some complementary coffee, hot cocoa, cider, cookies, and candy canes. Christmas break is in full swing !!!! This locally owned and operated farm has been serving Kay County since 1988. This farm is family owned and operated and provides a charming Christmas experience to locals and visitors alike! This farm has more than 3,000 trees of different ages and sizes. They carry Virginia pine, Scots pine and Leyland cypress trees. If you’re allergic to pine, the Leyland cypress is a great option that looks wonderful all dressed up in Christmas splendor. Fought the cold and got us a #christmastree finally. #betterlatethannever Good lookin bunch. The farm is open on the weekends for picking your tree, as wsell as Friday nights from 3:30 to 6:00 p.m. If you, your familiy, and friends want to get in the holiday spirit stop by to enjoy live music, a fire pit, games, holiday drinks galore, and much more. "This is the spirit of the Griswold family Christmas"
This farm is open through the week, but has tractor wagon rides to the fields on the weekend. Free hot chocolate and coffee to warm you up while you’re waiting for your tree to be prepared for the ride home. This farm opens the day after Thanksgiving for eastern Oklahomans to choose and cut the perfect tree that fits into your home. It has Virginia pine, Fraser fir among others in the field. One of the best things about this farm is the petting zoo and children’s activity area. Adults can get refreshments, hot chocolate and candy canes, while letting the kids get up close with the farm animals after picking out a tree. It’s a great place to make holiday memories. I hope someday Avalee will look back on these memories and cherish them the way I do.